We were set up to feel like failures in romantic relationships because: on one hand we were taught that romance was magical - from the fairy tales, books, movies, songs, etc. ; while on the other hand our role models for how a relationship between a man and woman works were our parents - who were wounded in their childhoods. Generations of shame about sexuality, emotionally dishonest role models, and patriarchal views of women and children as property are the legacy we inherited. Romantic relationships are not the destination where we will live happily-ever-after. Romantic relationships are in fact, the greatest arena for Spiritual and emotional growth available to us. It is well worth the risk to take a chance on love if we are viewing it as a learning experience rather than the goal in, and of, itself. Romance is part of the journey - not the destination. There is nothing wrong with wanting the prince or princess to come into our lives. What is important is to know that they will have issues to work through - and they will push the buttons of our issues so that we are forced to face them. Romantic relationships are hard work. Robert Burney is a codependency therapist, Spiritual teacher, and author of Codependence: The Dance of Wounded Souls. His work has been compared to John Bradshaw's "except much more spiritual" and described as "taking inner child healing to a new level." He lives in Cambria CA and shares over 200 pages of content on his web site at http://Joy2MeU.com. He has been the editor of the Inner Child/Codependency Recovery page of Suite 101 since March 1999. 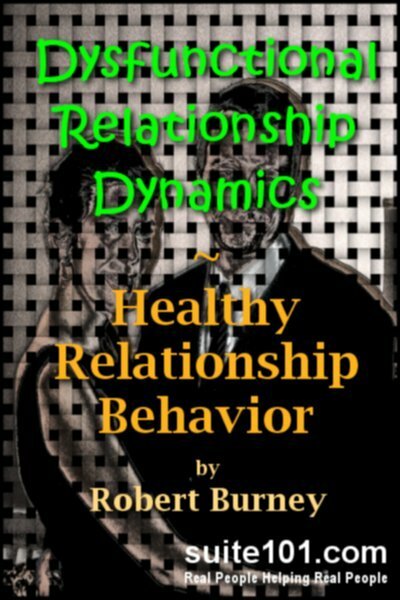 Robert Burney, the author of "Codependence: The Dance of Wounded Souls" does not fall into the twin traps of stereotype and righteousness. The 35 pages of his e-book are a clear-eyed and useful exploration of the differences between toxic, obsessive, and addictive forms of "love" - and the real, growth-enhancing thing. He starts by asking why many of us feel like failures in our romantic relationships. He attributes this to socially-sanctioned unrealistic expectations and defective role models. In our adult relationships, he warns, we tend to repeat and recreate childhood abuse. He then proceeds to explore the various forms of dysfunction: power struggles, codependence and counterdependence, shared psychosis, and approach-avoidance. You may download the file at any time but you will need the password to open it.